Since 2002, Abbey Road LIVE! has been rocking the music of the Beatles at clubs, theatres, festivals, and private events. Initially a tribute to the monumental "Abbey Road" album, the band has expanded its scope to include more than 100 Beatles tunes, from all eras of the Fab Four's career. 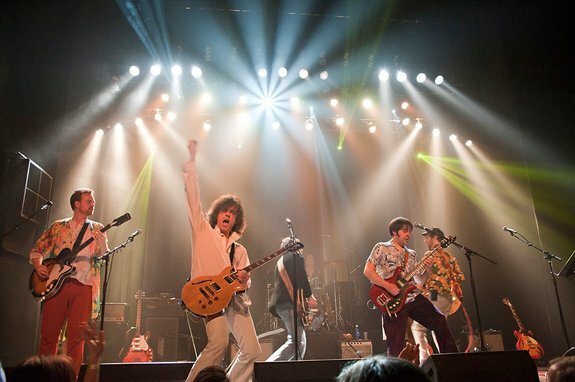 The band specializes in complete, start-to-finish album performances of masterpieces such as "Abbey Road", "Magical Mystery Tour", "Rubber Soul", "Revolver" and "Sgt. Pepper's Lonely Heart's Club Band". Abbey Road LIVE! is not your typical Beatle look-alike tribute act; don't expect mop-top haircuts and vintage Rickenbacker guitars. Rather, this show is about bringing to life some of the more mature and complex Beatles material in a raw & spirited fashion, while remaining true to the original recordings. Combining attention to detail with a creative exuberance, the band always delights its audiences with its diverse repertoire of hits and more obscure favorites. Abbey Road LIVE! is made up of four all-star musicians from the infamous Athens GA music scene that gave the world R.E.M., Widespread Panic, and B-52s. Collectively the band members have recorded and toured regularly with Cosmic Charlie, Charlie Mars, and Fuzzy Sprouts. Individual band members have also collaborated with acts such as Indigo Girls, Juliana Hatfield, Mike Houser (Widespread Panic), Danielle Howle and Lemonheads. While the four lads from Athens GA generally perform as a quartet, they have also been known to recruit the "Magical Mystery Horns" and the "Lonely Hearts Strings", lending authentic accompaniment to the more elaborately orchestrated tunes. The latest addition to the Abbey Road LIVE! musical arsenal is a real Indian sitar and tablas. At a typical Abbey Road LIVE! show, audiences young and old can found gleefully singing along with every word, many in utter disbelief at getting to hear this monumental music performed live; something that even the Beatles themselves never did, since they stopped touring in 1966.